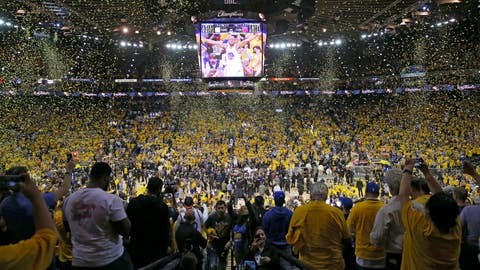 The Golden State Warriors are NBA champions for the second time in three years. Their 67-15 regular season record – tied for the seventh-best winning percentage in NBA history – concluded with a 16-1 march through the playoffs, the best postseason performance the NBA has ever seen. Golden State claimed the best record in the simulation, and it wasn’t particularly close. The Warriors came out on top in 75.5 percent of contests and averaged a simulation-best 106.0 points per game. The Warriors ranked 11th in points allowed, holding opponents to 96.5 points per game. The 1995-96 Chicago Bulls finished runner-up with a 67.8 winning percentage. Two more Bulls teams, the 1996-97 and 1991-92 squads, finished fifth and sixth, respectively. Golden State’s 2015 championship team came in third place, while the 2012-13 Miami Heat were fourth.